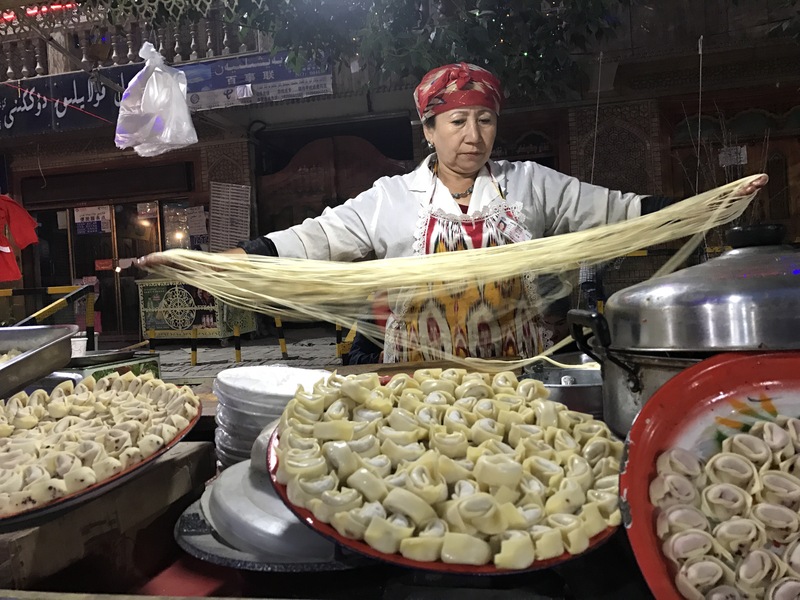 Back to the hostel which tourist gather around in Kashgar from our Karakol highway, my body started to react discomfort of radical time and space traveling. I said Hi to a Japanese couple who we shared the same dorm in Tashkurgan. I thought it was headache problem that made me feel sleepy, then I went to sleep with stomach flatulence. After I woke up, I started to fart, diarrhea, finally I ran to the toilet throw up all my lunch. Google told me it’s only slight mountain sickness symptom, what a relief! I went to counter to pay the fee of last night and told them we’ll stay one more night then head to the border. Hostel staff informed us that border is closed on the weekends. So we forced our plan changed then leave on Sunday. We never planned too much budget for accommodation, but we had have spent 5 nights in hostels these days! we said goodbye to road trip partners. It’s a day of diarrhea and doing nothing, but I had some fresh milk from an old man, he sales barrels of fresh milk on the street. It’s not easy to get fresh milk in China. Misha said the best recipe for diarrhea is Yogurt. You can find lots of Yogurt in convenience store, Uyghur people sale shaved ice with yogurt on it. Such a diarrhea city. I had yogurt and took medicinal activated charcoal, this is an effective rest day. We met a couple in next door, Marlin and Alex. They have a similar travel route like us, hitchhike across Asia to Europe. Yesterday I couldn’t talk to them, since I was exhausted. They were the same as me. We showed them the night market which we had our body scanned by polices. During chatting with Marlin, I got she had diarrhea problem. She also told me that “There are a lot of people got diarrhea here, because I heard terrible sound from the toilet." There’s a shared toilet between our dorm room. Hopefully, she doesn’t know that was me. Traveled through the over-renovated thousand years old Kashgar, desolate Tashkurgan and the natural resources dug out of the land. Xin Jiang has not been peace since 19 century, this made me want to leave China as soon as possible. We focused on hit on the road, still, Han people stopped for us. Two young people invited us local food in Artus. During the conversation, they said Han people got more benefits if they work in Xin Jiang or Tibet. No wonder I heard sister of a friend plans to work as an accountant here. The girl expresses passionately how much she loves Xin Jiang. After lunch, she even made a phone call to a colleague to take us to Uchia-a border town. I didn’t expect to get to Uchia so soon. It’s just one more lonesome boring place. A hotel seemed to be under construction for a long time, Door-closed buildings, no people on the streets, empty, nothing. But the only import store full with customers, there are lots of goods import from Russia, Ukraine, Stan countries. Especially alcohol, chocolate and tea products. Although they are more expensive, we chose some beer and chocolate to comfort our homesick taste. Finally, I don’t have to buy Snickers anymore. Yes, it’s always a good choice to bring on the road, it fills my stomach with one bar, it was also what I could find the best in convenience store in China. We walked to the next building with 2 floors, the first floor is under ground. Except a convenience store was opened on the right side, others were just full of dust and garbages. There’s no better-hidden place for our tent, we decided to camp underground tonight. We made hot tea on a broken ping pong table which located in front of the building. A gust of wind blew and then all the scene changed, did not expect the wind is getting bigger and bigger also began to rain, the glass of windows and doors was blown thunder, I nervously hid to the convenience store. No idea how long it took to stop this weather. I came out and saw the mountains already turned white, probably it snowed in a short time. It’s a magical nature. We back to the place where we want to camp. A man with a long stick came and asked us to leave. I’ve been unpleased with this dirty environment, now he made me more unhappy. I waited in the tent to dusk. Two police cars stopped by, around five to six policemen got off the car, and one in a different suit, I think he’s the boss, he had an angry face. Of course, boss’ tone was very bad. I felt like if we don’t listen to them I would be expelled from China. I forced to leave the tent to have my passport checked. “Please, we only stay here one night, we are leaving to Kyrgystan in the early morning." I said. “No way, it’s very dangerous, what if something dangerous happened to you, we are all in trouble." police said. Actually, I think it’s safe to stay near the border. Misha insists we don’t have money for a hotel. “How would you travel without money?" police asked. “There’s a friend waiting for us in Kyrgystan side. He’ll help us. We have only few RMB left now, we thought to leave China very soon, so we spent most of them." I said. We both sides hold a firm tone and position for some time. Usually, I am cowardly timid, I’d packed away immediately. Do not know how many excuses I answered, and finally, we packed the tents and backpack leave with the policemen to the hotel. On the police car, I suddenly thought that the time we stayed one night at the police station in Thailand, perhaps it works in Xinjiang. “I am sorry, we really have no money, could you please let us stay in the police station?" I said. “I am sorry, we really have no money, could you please let us stay in the police station?" I said. “Police’s duty is to serve for people, we should help you." a police sit in front of me answered. Ah ha! So you still remember this old-school slogan is not only a slogan. He made few phone calls, the answer is “NO". We arrived at the hotel. “Do you have any credit cards? I can take you to withdraw money, or you have some dollars, you can change the yuan with me." Police driver said, I really feel ashamed now, but it’s a loss for us to spend such amount of money, so we insisted our position. “Maybe you could stay in a hotel, the one cooperates with the government. Let me ask if they are open today." Policemen were really kind to solve our accommodation problems. He made few phone calls, the answer is “NO". “Captain promised you two camping at the place he ordered. So we could check in anytime." he said. I felt relief, and finally we return to the back of the same building, a half-built hotel.